YVUCET 2019 2nd phase Counselling dates,Certificates verification process| YVUPGCET 2019: Yogi Vemana University has issued Post Graduate Common Entrance Test(PGCET ) 2019 Notification on .... March, 2019 and YVU is inviting online applications from the candidates who have passed or appearing for the final year examination in the qualifying degree for admission into Post Graduate courses as listed in its website (www.yvudoa.in) leading to Post-Graduate degree in M.Sc., MA., M.S.W., M.Com., M.H.R.M., M.Ed., M.P.Ed., PGDAS., P.O. 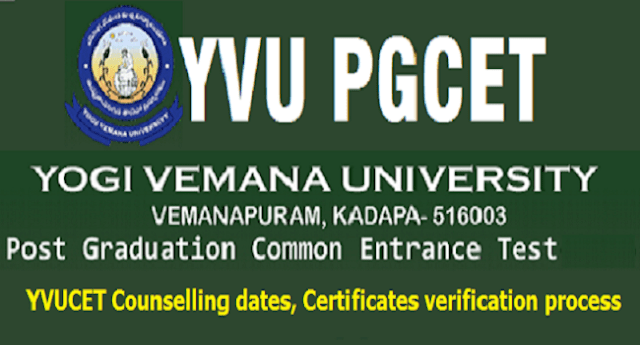 Diploma in Yoga., 5 Years Integrated Courses in M.B.A. and Nanotechnology for the Academic Year 2019-2019 offered by Yogi Vemana , PG Centre and its Affiliated Colleges through YVUCET-2019. PG Entrance Exam would be conducted as per schedule on ... May. 2019. After announcement of results/rank cards, counselling dates would be released. So, candidates should attend the certificates verification process with the following certificates. Candidates must be attend to YVUCET - 2019 Entrance Test and Counseling are eligible for Fee Reimbursement. 1) An amount of Rs. 400/- for OC & BC and Rs. 200/- for SC/ST candidates needs to be paid towards counseling fee. Other University students have to pay an additional fee of Rs. 250/-. 2) All the candidates are required to come with the specified course fee mentioned in the prospectus along with Original Certificates and two sets of Xerox copies. 3) The candidates who are eligible for fee reimbursement are required to bring the Bank account number, Account holder name, Bank name, IFSC code, Bank Branch name, Mee Seva Cast Certificate number, Mobile number, E-mail ID, Aadhar Number with proof. 4. If any candidate fails to report to the allotting YVUthority (Director, Directorate of Admissions) when his / her Rank / Name is announced, he / she will be considered for allotment at the end of that Session subject to availability of seats and no explanation for the delay in reporting to the allotting authority will be entertained.